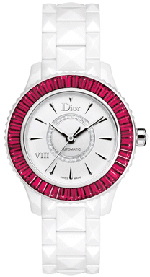 Collection Dior VIII Baguette replenished three novelties. The legendary fashion house Dior has pleased his fans and admirers of spectacular innovations. The legendary fashion house Dior has pleased his fans and admirers of spectacular innovations. Collection of Swiss watches VIII Baguette with housing diameter 33 mm enlarged interesting models, decorated with precious stones. Careful work is the best craftsmen to improve the size and cut stones bore fruit: the new models are both external and internal improvements. Model Dior VIII Baguette Diamonds with a gold bezel decorated with oblong diamonds, made in white ceramic. Fully consistent with the chosen style white lacquered rotor. The body is made of white gold, white, high-tech ceramics and diamonds, complete with a crown with a white ceramic insert, transparent back with sapphire glass. Dial Swiss watches made of silver opaline. Time mark in a diamond shape indicates VIII in 8:00. “Red – my lucky color” – claimed to Christian Dior. Dior VIII Baguette Rubies – a new Swiss watch, perfectly combining a white ceramic case, gold bezel, decorated with magnificent rubies oblong in quantities of 50 pieces of approximately 4.17 carats, and harmonizes with the color of the stones curl under the sapphire glass of red. The case is presented in a white high-tech ceramics, white gold and rubies. There are crown with a white ceramic insert, transparent back case of sapphire glass. Dial from a silver opaline has a diamond-shaped hour markers showing VIII in 8:00, a black inner ring with diamonds (32 diamonds, 0.1 carats) and an outer ring of opaline. It would be quite in the spirit of Dior forget about favorite pastel colors in the development of new products. 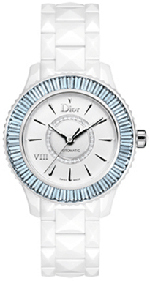 Watches Dior VIII Baguettes 33 MM – model, made in black and white ceramics. The color of the rotor, sapphire glass secured, ideally combined with amethyst, peridot and aquamarines, which are decorated with colored bezel. Wrist watches with amethysts Dior VIII Baguette Amethysts are presented in a black ceramic case with white gold, amethyst and diamonds, fitted crown with a black ceramic insert, rotor under the sapphire crystal purple, transparent case back made of sapphire. Dial black, lacquered, the inner ring is decorated with diamonds. Swiss watches Dior VIII Baguette Peridots, a rotor equipped with a sapphire crystal is green, as shown in the white and the black versions. “Light model” is different with white pearl dial, white ceramic bracelet and the outer ring of the opaline. All models are collections of Dior VIII Baguette have a body diameter of 33 mm, automatic plant and a 40-hour power reserve, water resistant to a depth of 50 meters is equipped with anti-reflection Case sapphire crystal. Marks on the outer ring of the dial, as well as the minute and second hands – fluorescent. Watch features include: hours, minutes, seconds.